Thomas Chapple is the author of Base Building for Cyclists and is a licensed Elite level USA Cycling and USA Triathlon coach. 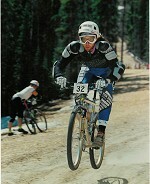 He has competed at the national level in Downhill Mountain bike racing, and regionally in road and track. Since I started coaching full-time in 1997 I have helped athletes finish their first race or century, as well as helping athletes advance from local competition to placing at National and World Championships. Athletes I've coached have won their age group and placed as top amateur at The Ironman World Championships in Kona Hawaii, placed on the podium at the US Pro/Elite National Criterium Championships, won 24 hour solo mountain bike races, and placed 2nd in RAAM. Success. Coach Thomas Chapple has been notified of your message.